Mike Trout just signed a huge contract. He'll be receiving $430 million dollars playing for 12 years with the Los Angeles Angels. Let's take a look at some of the other big world sports' contracts from the NBA, NHL, NFL, MLB and European Football (what Americans call soccer). 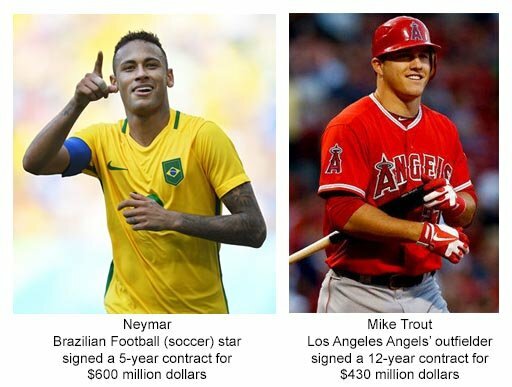 We often hear about big player contracts. Who makes the most per year? Per game? What sports? In this activity, with a twist on unit rate, students find the average pay per year or "unit rate of pay" for a collection of highly paid athletes. Students think about unit rate; proportionality; slope; the relationship between multiplication and division; and the contrast between the pay of various sports. ← Does seeding really matter?